If you love the outdoors but also your creature comforts, café blinds can be a great way of combining both. Café blinds installed on an outdoor structure such as a verandah or patio can be a great way of extending your enjoyment of Launceston’s outdoor lifestyle. In summer, café blinds will do a great job of keeping out hot summer winds. 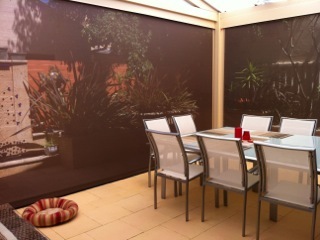 And when the Launceston weather turns cold and wet, café blinds will keep your decked area dry and livable. With options such as different colours, patterns and designs to choose from, today’s café blinds are more aesthetically pleasing than ever before. Plus, with zip-up, roll-up, track-guided and motorised systems to choose from, they’re also easier to raise and lower. Which allows you to make the most of whatever the weather throws at you. Outside Concepts can provide a free design and quote service for your Launceston café blinds. Phone us on 1800 601 674 or visit our website (Launceston café blinds) for more information.